What is a Bag Mark on a Mint U.S. Coin? A bag mark is a ding, scratch, indentation, scrape, or other blemish caused by the coins bumping against each other in mint distribution bags. Bag marks, a form of contact mark, become more common and more severe the larger the coin is. Bag marks look like dents and dings caused by the edges of other coins, but sometimes take the form of reeded edge impressions. Early United States coins were minted in facilities that employed manual labor or steam powered coining presses to make the coins. Originally, planchets were fed into the coining presses by hand. After the coin was struck it was briefly inspected for quality assurance purposes and tossed into a bin. The bin was then transported to a counting and secondary inspection room where thousand coin bags were assembled. Larger coins, especially silver dollars, resulted in bags that weighed approximately 60 pounds. As mint workers move these bags within the facility they tended to toss them irreverently onto skids in preparation for transportation. All of this moving around resulted in the coins bumping and grinding up against each other. Coins that have a reeded edge tended to leave a series of small evenly spaced indentations on the surface of the other coins that they came in contact with. Modern United States coins (after 1964) are now minted in automated facilities. Planchets are transported throughout the mint facility on conveyor belts to be delivered to the coining presses. After the coin is struck it falls down a chute into a large collection bin. These bins can weigh thousands of pounds and are transported within the mint facility by forklifts and cranes. The coin bins are then dumped into a machine that counts and bags the coins. The bags are approximately 4 feet on each side and weigh thousands of pounds each. They are known as "ballistic bags" and are moved throughout the facility by overhead cranes. Moving these heavy bags causes the coins to scrape and gouge the other coins during their transportation resulting in bag marks on the surface of the coin. Bag marks can be found on both circulated and uncirculated coins. The effect of bag marks on a coin's grade is more significant on uncirculated coins then circulated coins. 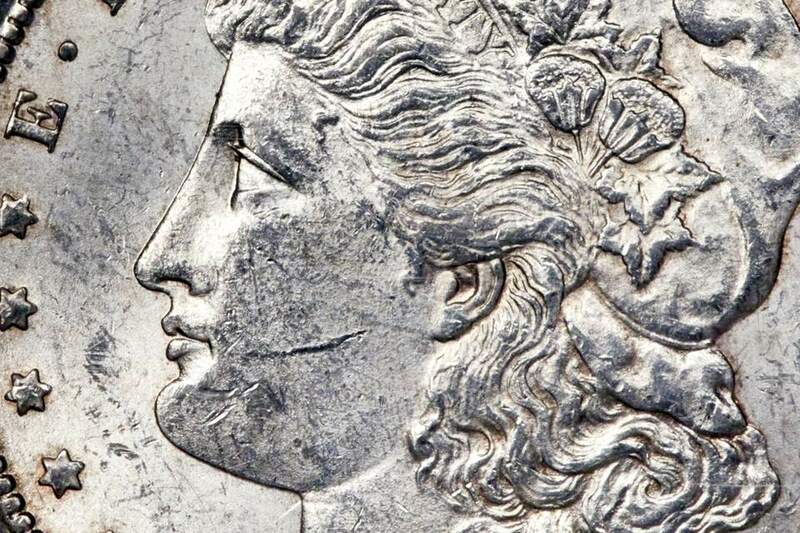 It is almost impossible to tell if a bag mark on a circulated coin resulted from handling at the United States Mint or during its normal course of commerce. Bag marks on uncirculated coins are most always the result of handling within United States Mint facility. An uncirculated coin will show mint luster across the entire surface of the coin even though bag marks can cover most of the coin's surface. The key indicator that the coin has never circulated is the unbroken mint luster. A coin with many bag marks on the surface will result in a lower uncirculated grade (MS-60 to MS-63). Bag marks on Presidential Dollars are often mistaken for "dropped letters" when the edge lettering of one coin leaves its mark on another.